Vice President and Prime Minister of the UAE and Ruler of Dubai His Highness Sheikh Mohammed bin Rashid Al Maktoum reviewed the progress of Dubai Creek Tower, the global icon in the heart of the 6 sq km Dubai Creek Harbour. His Highness was accompanied by Deputy Ruler of Dubai His Highness Sheikh Maktoum bin Mohammed bin Rashid Al Maktoum; and Chairman of Mohammed bin Rashid Al Maktoum Knowledge Foundation His Highness Sheikh Ahmed bin Mohammed bin Rashid Al Maktoum. 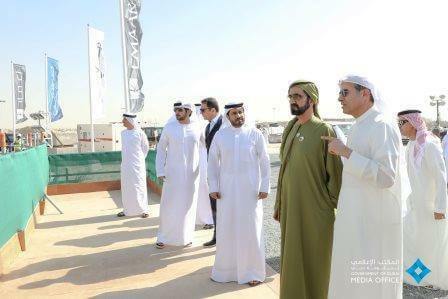 Chairman of Emaar Properties Mohamed Alabbar; Chairman of Dubai Holding HE Abdullah Al Habbai and high-ranking government officials and the senior managers of Emaar were also present during the visit. The visit of His Highness Sheikh Mohammed coincides with Emaar setting a new milestone in the construction of Dubai Creek Tower. With the placement of concrete for the pile cap commencing in September last year, the core of the pile cap has now reached its highest point. Over 50 per cent of the pile cap has now been finished with completion scheduled for mid-2018. Dubai Creek Tower’s pile cap is an approximately 20 metre thick multi-layered, tiered reinforced concrete top that covers and transfers the load to the foundation barrettes. To date, about 25,000 cubic meters of concrete has been poured, weighing about 60,000 tonnes or half the weight of the CN Tower in Canada. About 12,000 tonnes of steel reinforcement has also been placed, nearly twice the weight of the Eiffel Tower.